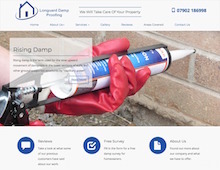 Longuard Damp Proofing is a family owned, Bristol based company who have been offering damp proofing, condensation control and other related services for over twenty years throughout the Bristol, Bath and Gloucester area. Longuard offer a variety of damp proofing treatments and solutions to prevent damp problems in your home. These services include rising damp treatments, penetrating damp treatments and more. They can also offer damp surveys in Bristol and the surrounding area, to assess any existing damage and find the best solution for the customer. If you have damp problems or need a damp survey in Bristol, Bath, Gloucester or the surrounding area contact Longuard Damp Proofing. Condensation control is important, as condensation is a common issue in most homes, when you heat some rooms and not others, the warm air in the heated room will absorb moisture, which can then spread throughout the house and form condensation in the cold rooms. Longuard’s house ventilation systems can prevent damp that occurs due to condensation. For condensation control in Bristol, Bath, Gloucester and the surrounding area, contact Longuard Damp Proofing today.